Ground covers are usually plants — less than 18 inches in height — that are vigorous in growth and are planted as an alternative to turf grass or in areas such as shade, where grass does not grow well. In South Texas, we have several native plants, and well adapted plants, that can serve as a ground cover and support several butterfly species. False Honeysuckle (siphonoglossa pilosella) is a low growing, dense ground cover that will tolerate light foot traffic and mowing. It has small lavender flowers, appearing from early spring through late fall, that provide nectar for several small butterflies. It does well in full sun, but will tolerate partial or full shade, as well. In my neighborhood, it is spreading into both Bermuda and St. Augustine lawns rather quickly from a planting at a yard across the street and several yards south of ours. This is the type of native plant that you will probably find at a local nursery or at one of the nature centers where they sell plants. It grows from cuttings or seed. It might be best to try it in a small area in partial shade. The False Honeysuckle will require moderate irrigation. Most of the lawns where I have seen it thriving receive irrigation during the warm months. Sawfoot frog fruit (phyla incise) or common frog fruit (Phyla nodiflora) are two different frog fruits that are low growing, dense ground covers bearing small white daisy-shaped flowers. The phyla incisa is 2 to 4 inches taller than the ground-hugging common frog fruit. The foliage is evergreen. It requires regular irrigation, especially during the summer, but do not over water. Soils must be well drained. 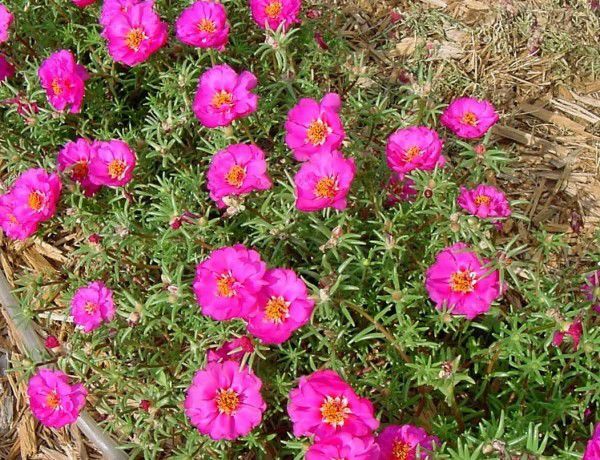 Chisme, or moss rose (Portulaca pilosa) is a native purslane that has small elongated leaves and a small purple to dark pink flower. This plant blooms from spring through fall and is happy in full sun to partial shade. It requires good drainage and will not tolerate standing water. Once established, it will need irrigation only during warmer months of the year. The moss rose can recover from some foot traffic, but it is not aggressive in its growth habitat. This plant is probably best in a rock garden or used in small areas as a ground cover. Wedelia trilobata is native to the tropical Americas. It is similar in appearance to our native Wedelia, but is far more aggressive in its growth habitat. 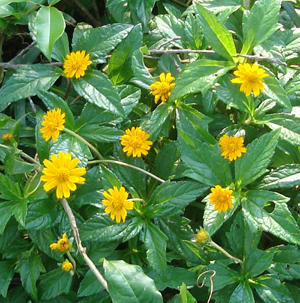 This plant forms a dense ground cover that reaches about 8 to 10 inches in height. It is very drought tolerant, once established, and will not perform well if over watered. It needs well drained soils and can be used on slopes where nothing else will grow and is especially good for erosion control. It flowers in partial shade and full sun. If a freeze occurs, mow it back, just before the weather warms up in February, and it will come back as thick as ever. The bees and butterflies enjoy the nectar of these bright yellow daisy type flowers. This plant is available at local nurseries. For additional information on ground covers, refer to “Cacti, Ground Covers and Vines of the Lower Rio Grande Valley, Tx,” by the Native Plant Project (available at the Valley Nature Center in Weslaco) or go to aggie-horticulture.tamu.edu and search the native plant database. Barbara Storz is a local horticulturist. You can tune into her Saturday morning garden show on 710 KURV radio, or e-mail her at bstorz@rcommunications.com.